Crowdbooks' United States Public Realtions representative Kate Miller took the time to talk with us about the recently launched site which aims to harness the potential of crowdfunding or "participative financing" for the publication of photography artist books. You can stay updated on Crowdbooks on both Facebook and Twitter. 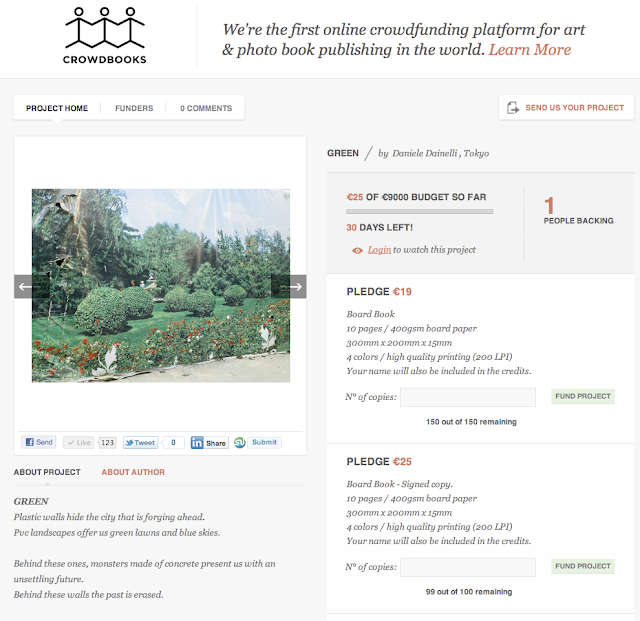 Kate Miller: Crowdbooks is the brainchild of Stefano Bianchi. He has worked as a graphic designer for many years and has seen too many good photo projects pass through his hands that were not being published. Often this was because publishers didn't want to take risks on certain themes or because some books were "too expensive" and not good in terms of ROI [Return On Investment]. So he decided to find a way to help photographers with great photo projects turn their dreams into compellingly beautiful finished photobooks. And Crowdbooks was born out of that desire to transform these brilliant projects that were being passed over for the above reasons into something spectacular. Stefano's passion for photography, graphic design and photobooks is the driving force behind the development of Crowdbooks. As for the first projects currently listed on the site, Stefano is working with talented photographers worldwide. When Stefano saw the photos and concepts for PURGATORIO and GREEN, he liked what he saw. And the rest is history! 2) to create unique and vividly stunning photobooks using only the highest quality of materials, graphic design, etc. while avoiding the mass-produced photobook mentality and finished product. We're looking to build a community of passionate people who want to participate in a publishing revolution; people who like and understand our work as an added value to the photographer, that are curious about the process of making a book and are ready to support our endeavors to create "unique objects of art." Additionally, Crowdbooks provides a full range of publishing services and we're offering specialist expertise and advice for museums, galleries, artists and others who want to create the finest illustrated books and reach audiences of all ages with their publications.